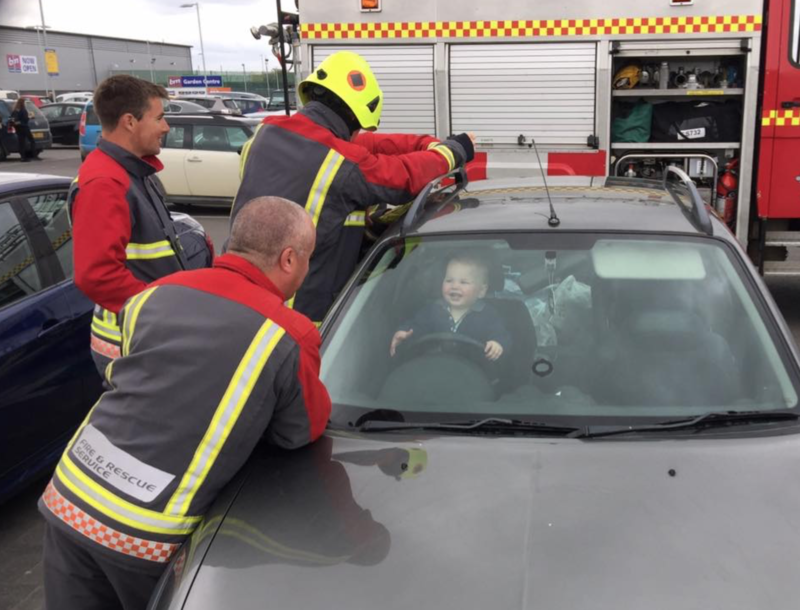 When this little guy got locked in his mum’s car, a bunch of firefighters not only came to the rescue, they brought the smiles too! Mum Kirsty Green posted a heartfelt thank you to Bude Community Fire Station’s Facebook page and the accompanying image has captured the attention of the internet. Apparently a series of unfortunate (and relatable) events led up to the rescue shot. Kirsty accidentally locked the keys in the boot of her car as she loaded groceries in. Then her little boy, Brandon, managed to lock all the car doors of the car – from the inside – too. Today reports that a bystander called emergency services as a frantic Kirsty stood by and waited for help to arrive. A short time later five burly gents from Bude Community Fire Station were on the scene. They worked on unlocking the car AND kept Brandon’s spirits up. By this point the little guy had climbed into the front seat of the car and was pretending to drive, as he grinned at the helpful firemen. The firies worked to open the car door without causing any damage, but when Brandon found a coin in the console and popped it in his mouth, they were forced to smash a window. “Thank you to the amazing guys who rescued my cheeky monkey after locking himself in the car today at Bude Lidl!! He was clearly traumatised by the whole ordeal!” Kirsty joked in her thank you on the Bude Community Fire Stations’s page. The relieved mum later told Britain’s South West News Service that the entertainment seemed to go both ways, Today reports. Bude Community Fire Station eventually took to Facebook to thank followers for their outpouring of enthusiasm about this very special rescue. “We’re all absolutely overwhelmed at how far this picture has travelled… with local and national press, international press, and even sightings on television… Not to mention a comment spotted from Brisbane, Australia! Always a pleasure to get Bude on the map! #BigUpBude Cornwall Fire and Rescue Service Fire Brigades Union” they posted. Excellent job all ’round, we think!